Good morning, here’s your breakfast briefing for Tuesday, November 6. The Paddle League World Rankings may be capped for the year, but we still have a few more big events that are either standalone or will count towards season 2019. First up, I’ll be heading to Brazil for that country’s biggest ocean event: The Aloha Spirit Festival. 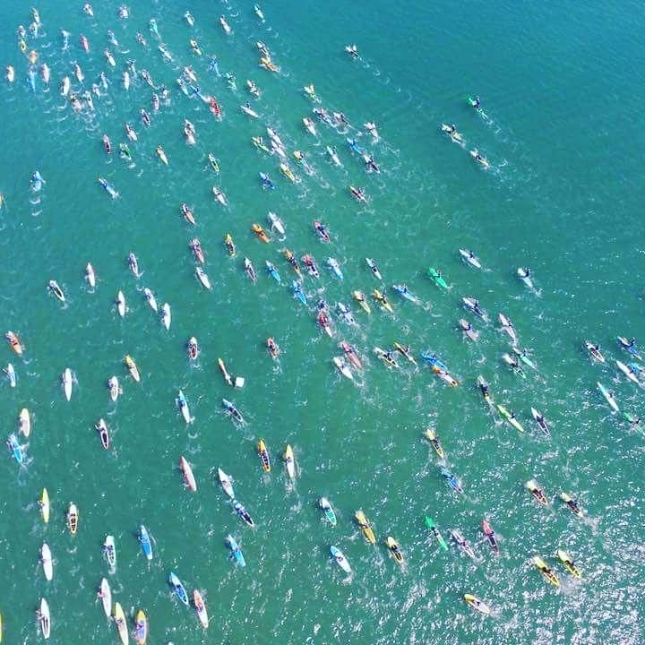 Now close to a decade old, the Aloha Spirit is an incredible weekend that combines stand up paddling, swimming and outrigger races into a huge celebration. It often gets 500+ competitors and is aired on national TV. Aloha Spirit is also a 4-star “Regional Major” event on The Paddle League. Stay tuned for full coverage from November 23-25. – The ISA Worlds in Hainan, China from November 23 – December 2, which will feature several top-ranked athlete. Oddly, we’ve seen very little build-up from the ISA — there’s been none of the usual promo videos or hype, and the website still points to last year’s event. Presuming it still runs as planned, the event will be highlighted by the addition of a new juniors division and the showdown between the “Big Three” (Australia, France and Team USA). – The Paris Crossing, which still narrowly holds the title of “World’s Largest Stand Up Paddle Race,” is set for Sunday December 9th. Last year’s event saw about 620 paddlers on the water, and this year organisers have invited up to 800 (though with 100 spots reserved for VIPs, it usually falls a little short of its ceiling). This year’s event will feature the likes of Michael Booth and Arthur Arutkin chasing points on the APP super league. – The King of the Cut (December 1st or 2nd, depending on best conditions) is one of Australia’s most-prestigious events. The West Oz downwinder enjoys some of the finest bumps and biggest names in the world of ocean paddling. Some of the regulars may be missing given the tight schedule with China, but the majority of Australia’s finest will be on show. Once again, the event is a “line honours” race that does away with board classes and encourages paddlers to use unlimiteds. Just like the Aloha Spirit Festival, KotC is another 4-star “Regional Major” on The Paddle League that will produce points for Season 2019. I love the “ultra” races and adventures in our sport. I find the stories from these ultra long distance events to be far more engaging than an average 10k race, and paddlers such as Bart de Zwart, Norm Hahn and Seychelle to be far more interesting than your average athlete. Which is part of the reason I was so fascinated by the ‘Great British Swim,’ an extraordinary effort by modern-day gladiator Ross Edgley to swim around the coast of mainland Great Britain. It’s nothing to do with SUP, but it’s so damn impressive it deserves a shout out. The mind-boggling effort (1,792 miles, for the Americans in the room) took 33-year-old Edgley – who is built for anything but swimming – 157 days to complete. He suffered dozens of jellyfish stings, a rotting tongue and the mental effects of never setting foot on dry land — he slept on his support boat for the entire five month odyssey. You can read more in The Guardian. There’s also a Red Bull TV series if you want to dig deeper.